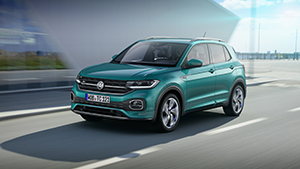 World premiere in Amsterdam, Shanghai and São Paulo: Volkswagen presents its new T-Cross, the company’s first small SUV, and thereby resolutely continues the SUV product offensive it began in 2015. This new model will soon be debuting in the markets of three continents with its combination of style, practicality, flexibility, connectivity and economy, and setting new standards for its class as it goes. The urban crossover model reveals itself to be an ideal companion in everyday life and beyond. The T-Cross is based on the modular transverse matrix (MQB), which allows the driven front axle to be located well forward. With a total vehicle length of 4.11 metres, the 2.56-metre wheelbase is comparatively generous, allowing a spacious interior with enough room for five people. For the greatest possible versatility in the interior, the sliding rear seat can be adjusted by 14 centimetres, allowing more passenger leg room or more luggage space. The luggage compartment holds between 385 and 455 litres. Thanks to a rear seat back that folds down fully or partially, in the blink of an eye it is possible to create a flat loading space with up to 1.281 litres of storage volume. Just like its sister model the Polo, the new T-Cross is manufactured at the Spanish Volkswagen factory in Navarra. Volkswagen is set to invest some one billion euros there by 2019 in order to serve the particularly strong growth in the market for compact SUVs. At the same time, approximately 10% more jobs will be created there. For the 2017-2027 period, independent forecasting institutes expect an approximate doubling worldwide of so-called CUVs (Crossover Utility Vehicles) in the small car segment – the class to which T-Cross belongs. In South America and China – two further growth markets – versions of the T-Cross specially tailored for those markets are being made. With the new T-Cross, Volkswagen is moving forward with its global SUV offensive. This was begun in 2016 with the current Tiguan. The Tiguan Allspace, carrying up to seven passengers, and the more compact T-Roc followed in 2017. Likewise the Atlas – designed for the USA – and its Chinese sister version the Teramont appeared in 2017, both as seven-seaters. In 2018, Volkswagen of America presented the two Atlas concept vehicles Cross Sport and Tanoak. In China the new Touareg is celebrating its world premiere, accompanied by two future SUVs for that region: the Powerful Family SUV Tharu and the Advanced Midsize SUV Tayron. T-Cross: The vehicle is not yet available for sale. Whare can I find the PCB?